It’s here again. 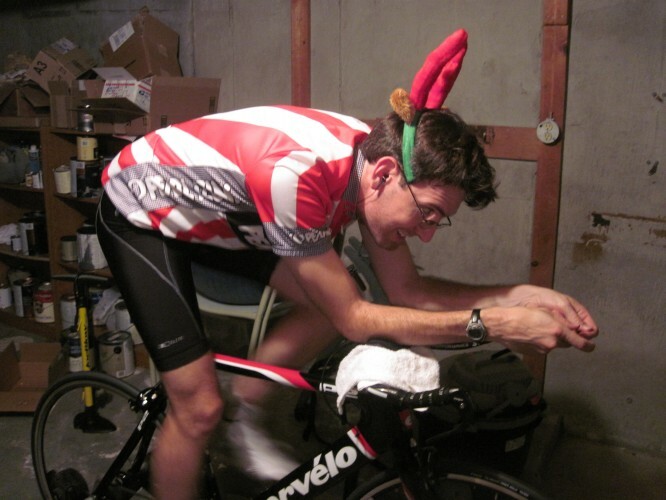 Yes, it is the holiday season, but I’m talking about the time of the year when those of us who love cycling (but also have day jobs) put the bike on the trainer and do a lot of our riding indoors. For some of us it represents a fundamental, existential crisis. “I love riding my bike for hours outdoors, but I hate spinning away for hours inside. How do I survive a winter on the trainer . . . or of no riding? *shudder*” Victoria—who has convinced me to do another JDRF ride next year in Nashville—recently posted her lack of love for the trainer, and it occurred to me that I have the solution, since riding inside never seems to bother me. Nothing is ever going to replace the amazing feeling of the air flowing around you as you push through it under your own power. You’re never going to have that thrilling feel of speed when you’re not moving at all. There’s never going to be same sense of accomplishment from climbing a mountain or going up and down little rollers when you’re staring at a wall or electrical circuit box or television or iPod or whatever might be directly in front of you. When there’s no need to change your pace, of course it’s going to feel monotonous. Two hours of not going anywhere might have same physical effect as riding outside, but it can be rather soul crushing. Since nothing is going to compare to the real thing, change the kind of riding that you do indoors. Tell yourself that outdoor riding is for the pure love of the bike, while indoor riding is solely to make yourself a stronger cyclist. On the roads you have fun, inside you ride with a purpose. Outdoor rides might go on for hours, but indoor training should be limited to 30-60 minutes. Indoors you do the hard work to make riding outdoors easier. Here are a couple of workouts you can do indoors in under an hour and not feel like you never want to see your bike again. These are sessions that I do myself. Every workout (indoors or outdoors) starts with 10-15 minutes of easy riding. I mean easy. By the end of the warmup, you’re probably going to be a little bored and eager to do something different, and that’s just what we’ll do. On “speed” days, you do a lot of short intervals, while “strength” workouts have fewer intervals, but they last a little longer. After the hard work, it’s time to cool down with another 5-10 minutes of very easy riding. The point is to clear the burn and give your heart a chance to settle down before you hop off the bike and get on with the rest of your day/evening. Speed: After the warm up, ride very hard for one minute before taking an easy spin for one minute. The hard part should feel ridiculously hard, as hard as you can go while turning the pedals at 80-90 times per minute; you don’t want so much resistance on the pedals that you have trouble turning them. (Imagine sprinting rather than climbing hills.) The recovery part should feel very, very easy . . . even easier than the warmup. You should barely be working at all, since the whole point is to try to get your heart rate back down from the stratosphere. Do 5-10 intervals, and you will have done a good 30-40 minute workout. Start with fewer intervals and eventually work your way up to a full ten. Strength: While the speed workouts are done at an intensity level that leaves you gasping for breath and bargaining with yourself to be able to finish them, the strength workouts—while still hard—are easy enough that you could imagine carrying on very short conversations. Hold back a little on the first intervals so that you can finish the latter ones at the same pace. After the warm up, ride at about 70% intensity for 2-4 minutes and then ride easy for 3-5 minutes. Do three or four, starting short and then building to longer intervals as the weeks go by. Hopefully these workouts will get you through the long indoor months during the week and that you can still find a way to get outside on the weekends. Let me know how they go for you! Now, if only someone could tell me how to make the best use of the treadmill. This entry was posted in Cycling, Life Lessons, Running. Bookmark the permalink. “Soul crushing.” Yes, that’s the word for it. Soul crushing. I like your suggestions, and I think I’m willing to try them. I’ll let you know how they work out for me. Several times, I’ve attached my bike to my trainer, put on my gear and then walked back into my garage. I stare at my bike, think about the boredom about to ensue and then I walk back inside. I fear I may be a lost cause. And you may *shudder* now, but you will thank me after Nashville! I promise. It. Will. Be. Epic. P.S. Perhaps if I try the antlers, it will help! Oh my GOOSES, I LOVE that picture! Haha! I have to admit that I’ve not done much biking since that whole crazy century thing in the spring. If I have a chance of hanging out with you guys in Nashville, I’d better get ta pedalin’! this is a pretty awesome post man. I like to think of the indoor trainer as a way to get the specific training that I can’t really get outside. Aand watch movies.